I was born and mostly raised in Southern California. I say mostly because there were seasons when I lived in St. Louis, Missouri with my father and stepmother. As well as the small stint my mother and stepfather moved us to Las Vegas, Nevada. Outside of those two instances I consider myself a California girl. A SoCal girl at that. We lived close to the beach growing up but never on the beach. We could always smell the salt water and feel the fog roll in from day to day. You would think that for someone who grew up close to the water that it's impact would have waned. Not for me. The beach has and always will be one of my favorite places. The ocean itself is both mesmerizing and terrifying. The hypnotic current of the ocean can draw you into a tranquil state of mind. While those same waves can take you under if you are not careful. 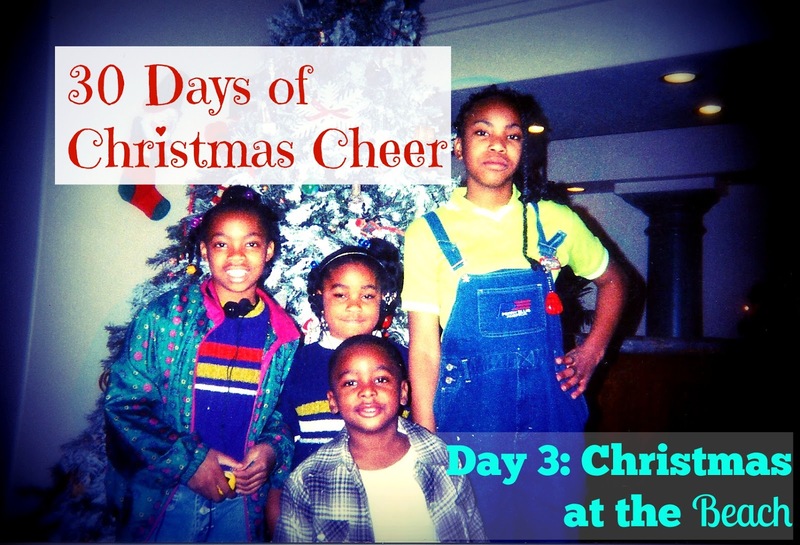 Nonetheless one of my favorite memories is from the time my family spent Christmas at the beach. This particular year my parents rented a 2 bedroom apartment by the water in Carlsbad, CA. We spent Christmas Eve, Christmas Day and the Day After Christmas there. It was such a great time. I remember the games me and my siblings played as we were passing time. We played the laughing game. It's a super silly game where one person has to get up and try to make everyone else laugh. The first person to laugh has to get up and try their hand at making everyone laugh. It's sort of like charades but instead of guessing you are trying not to laugh. We would play for hours. I enjoyed the debates that ensued about whether a snort was a laugh. And the house rules my siblings would insist upon, sort of like playing monopoly or uno with folks. Everybody had their house rules and we had ours. One of our rules was no sound could be made while the person was up. If you did make a sound then it was considered laughing. Those were the good ole days. When our only worry was if we could make each other laugh. This is also the year that eating Chinese food on Christmas Eve became a family tradition. I still remember the bright white china that held the orange chicken. The heaps of steamed rice and fried rice that covered the table and bowls of beef broccoli. This was before panda express. We had our favorite little Chinese food spots and the food was good. We went to bed that night with full bellies and expectant hearts. The next morning we opened tons of presents. We received Cabbage Patch Kids, Trolls, Furby's, Bendy Wendy's, Portable CD Players and clothes from Old Navy. And of course I cannot forget the digital pets. 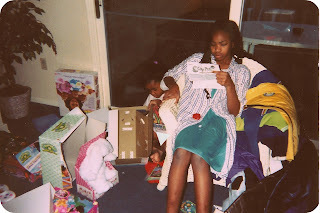 My sisters both received Tamagotchis and this was the year that I finally got my Gigapet. Those little gadgets were all the rage and I was so excited to have one. This is also the year that I got a portable CD player and my mom bought me a ton of CDs. I received the following singles, Blue by LeAnn Rimes, 2 become 1 by the Spice Girls and Phenomenon by LL Cool J. I spent countless nights jamming to to those tunes. I've always been a night owl so music has been a constant friend. Next to television and movies. Until the faithful day one of my siblings messed with the lens on the CD player. The lens that had the tiny sign that said do not touch. Yes that lens. I never caught the culprit but I have my suspicions. I'm not bitter. LOL. Not at all. Just curious. Anyway this was such a great Christmas for our family. Not just because of the gifts but because of the time we got to spend. One thing I always enjoyed were the conversations I had with my parents and siblings. During dinner they would ask us about our lives. Deep questions about life. They would laugh with us. I treasure those memories in my heart and I look forward to the day that I get to make those memories with my children. Well now that you know one of my favorite Christmas memories I would love to hear about yours. Leave me a comment down below with your favorite Christmas Memory. And as always thanks for reading.